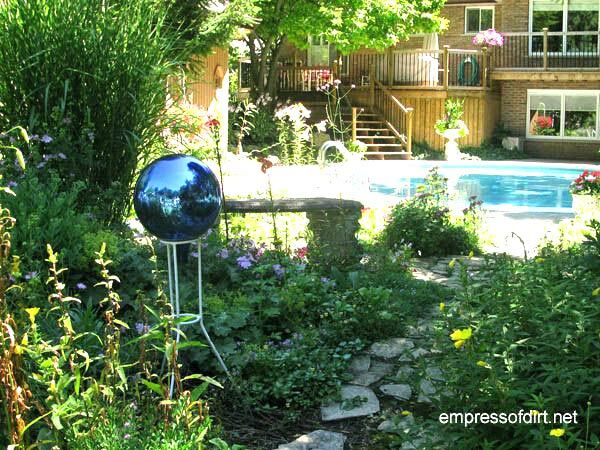 We can them garden balls, gazing balls, garden orbs, and globes, and they make great garden art for any yard.This is a an idea gallery to pick favorites for your growing space. 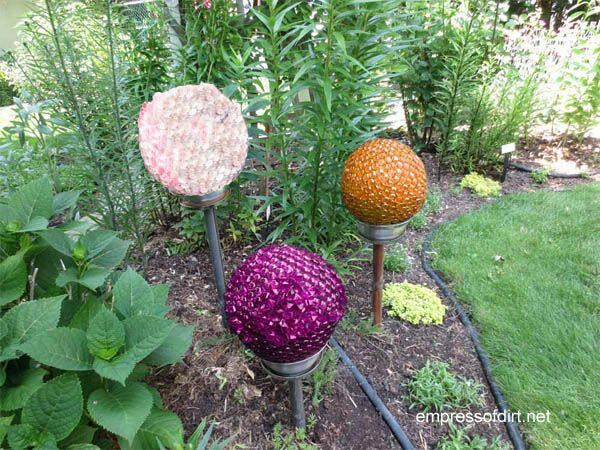 There is a free DIY how-to tutorial for making your own decorative garden balls here. 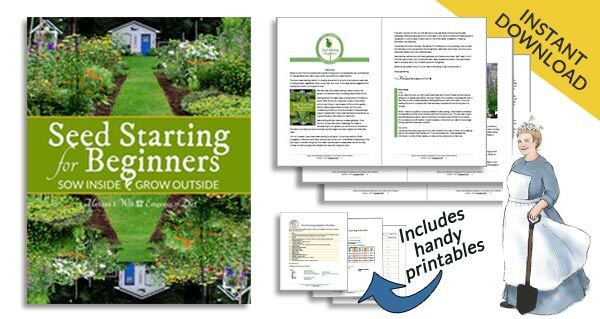 It includes information on the adhesive I recommend for long-lasting, outdoor garden art projects. 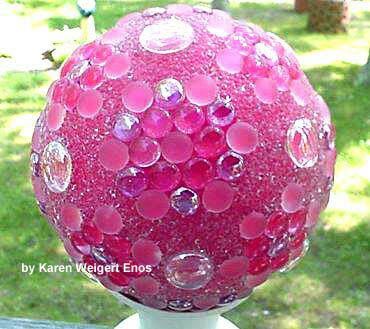 Here you’ll find a variety of garden ball styles plus suggestions for making your own. 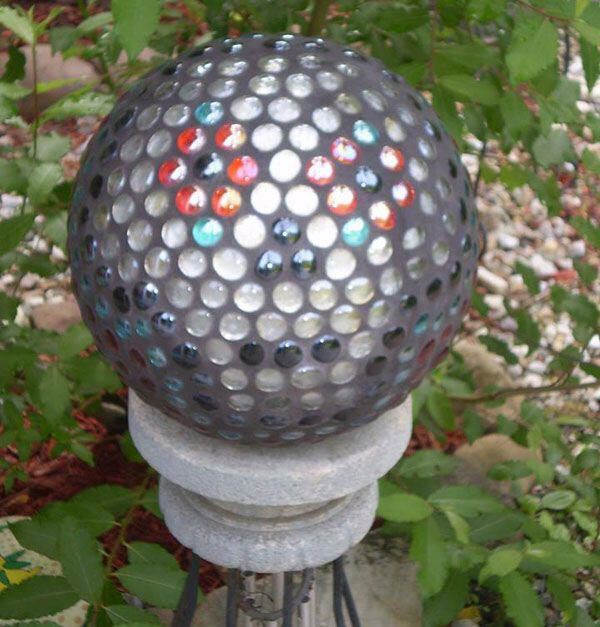 Many gardeners like to make these from old bowling balls (if they can get them cheap or free) but there’s other options as well including sturdy, old lamp fixtures. You could also buy a globe you don’t like and give it a new look. 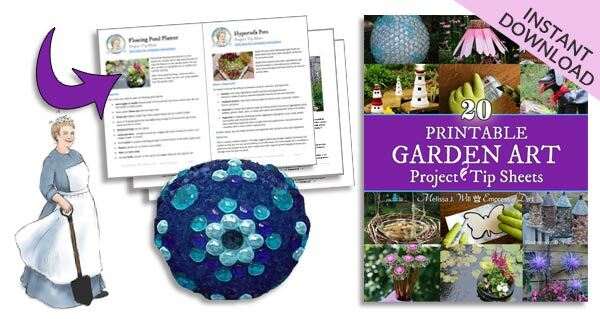 For step-by-step instructions and recommended materials see How to Make Garden Art Balls and The Best Adhesive for Outdoor Garden Art Projects. Easy Alternate Idea: Spray paint a lamp globe. 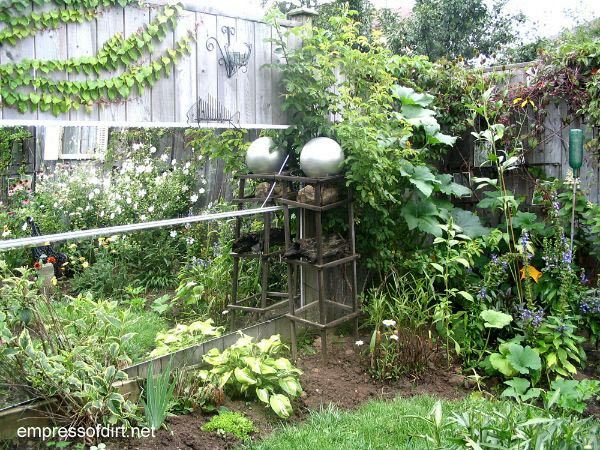 Gazing balls have been used as a focal point in garden for many years. When I first started gardening, I wanted one for my garden. And then I saw how much they cost. And that’s where I got resourceful. This is my first garden ball (above). I made it years ago and at the time I felt like I was inventing the wheel (the internet was still a wee baby). Today, of course, it’s commonplace. I took a ceiling light fixture, with a glass sphere and metal post, and spray painted it silver. The first question people always ask is, Won’t it break? And, after over ten years outside, year round, I can say no. I actually gave it away when we moved and now it lives on in a new garden. Inexpensive materials: use old lamp globes or bowling balls as the base and decorate with flat marbles. No need to grout them – the material used as adhesive (details here) fills in the gaps between the flat marbles (glass gems). Flat-bottom marbles or glass gems are inexpensive and available in a lot of colours, so it’s an easy way to bling-up your garden. If you use lamp globes for the sphere, they are lightweight and can be placed on old solar lamp stands like the ones you see here. Always look for older glass lamp globes with thicker glass. I get mine at the thrift store and I’ve never had a problem with breakage (knock wood). Bowling balls also work great for decorative balls you’ll display on the ground. Extra detail: Use small plastic or glass floral bits to fill in the areas between the flat marbles. 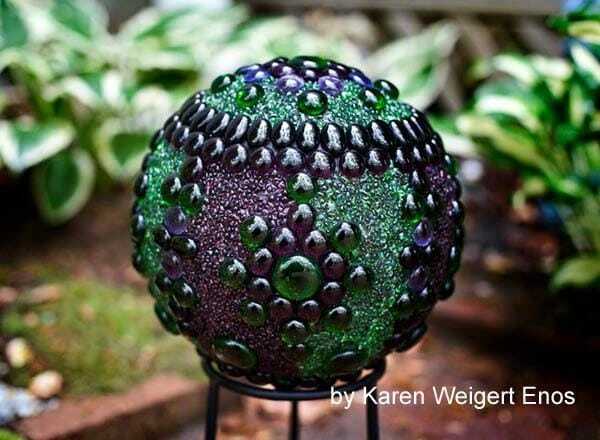 Karen Weigert Enos is a friend of Empress of Dirt on Facebook, and she has brought garden art balls to a whole new level. You can see a gallery of her garden globe creations here. The balls you see here have patterns or designed formed with the flat marbles, and then she has meticulously filled in the areas between the flat marbles with small floral bits (glass or plastic). These ‘bits’ can be found in craft supply stores, often in the floral design section where they sell vases and vase fillers. 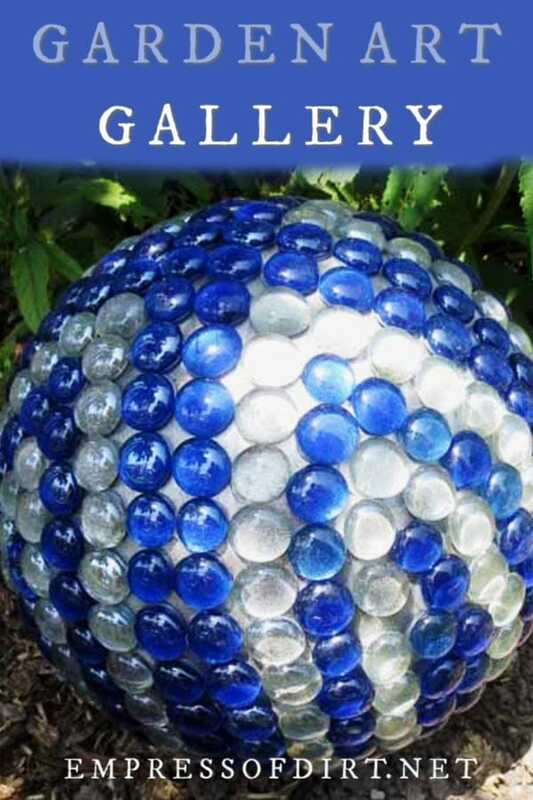 Idea: Use various colours of flat-marbles (glass gems) to form designs on the garden ball. Another option is to use various colours of glass gems to form patterns or designs. This one (below) uses green and clear gems. Again, the product used as adhesive (see the instructions for full details so you get the right stuff) acts as a pseudo-grout, filling in the gaps between the marbles. 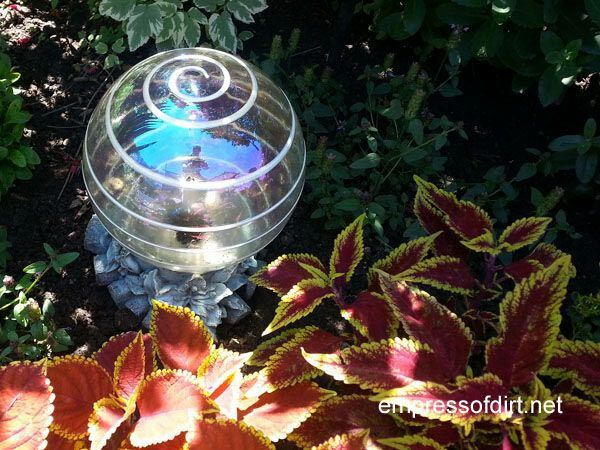 Idea: Use a clear lamp globe and display it as-is in the garden or add simple designs with paint. 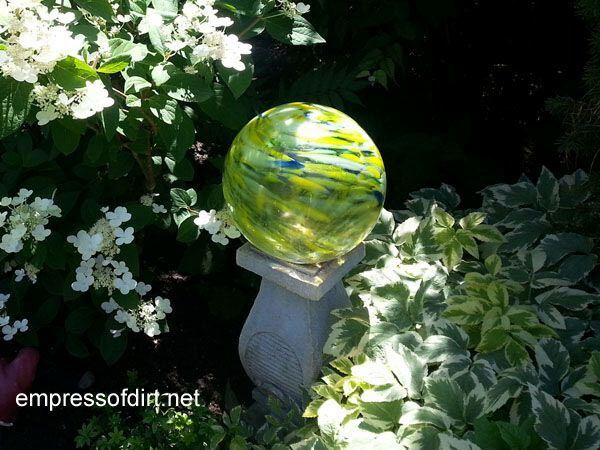 You can buy commercial garden art balls like this one, with a clear, glass globe, and (perhaps) a simple design painted onto the glass, or you can make your own. Again, find a clear, glass lamp globe, and add whatever design you like with glass paint or a stencil and spray paint. Idea: Apply paint to the inside of a clear ball to create unique designs. In addition to painting the exterior of the clear garden ball, consider applying paint to the inside. Pick a single colour or several, squirt them inside, and move the ball around to distribute the colours. If you don’t like how it turns out, you can always apply decoration (paint, glass gems, or decoupage) to the exterior. 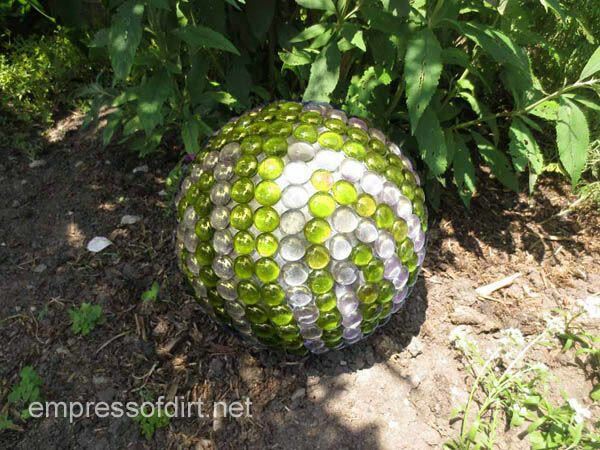 Idea: Cover a garden art ball in flat marbles (glass gems) and grout it. 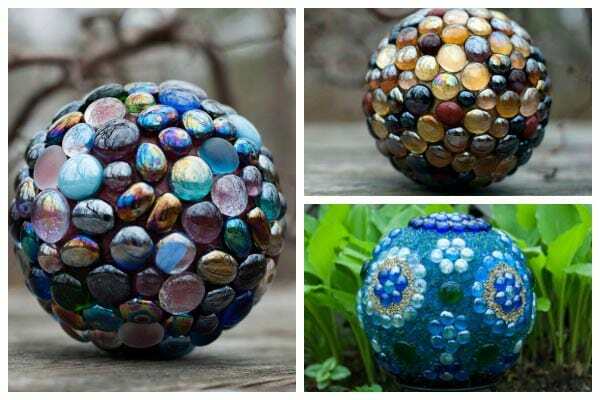 You can add mosaic design to garden balls. Whatever you use for the decoration (glass gems, mosaic tiles) will just need to be small enough and have a flat surface so you can adhere them to the ball. Grout can be tinted to any colour you like. Fill it in between the mosaic gems or tiles to give a unique look. There are lots of excellent books on how to do mosaic art. The Encyclopedia Of Mosaic Techniques: A Step-by-step Visual Directory, With An Inspirational Gallery Of Finished Works by Emma Biggs has everything you need to know. 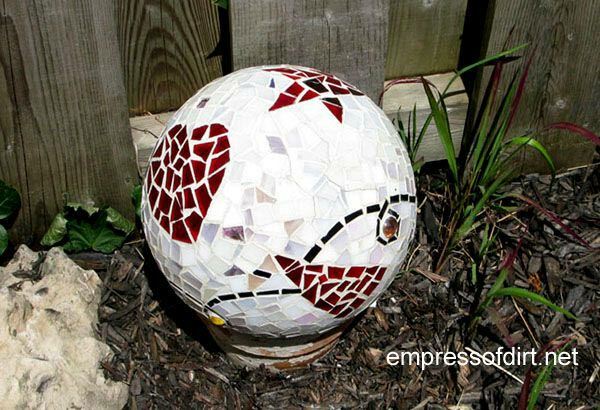 This mosaic garden art ball is by Carrie, a friend of Empress of Dirt on Facebook. 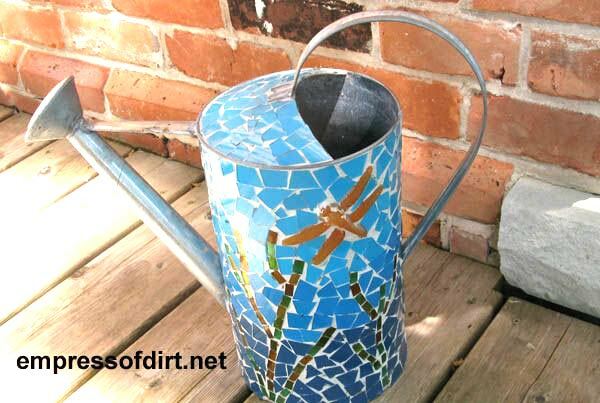 And, of course, you can mosaic just about anything like this wonderful watering can. Idea: Decoupage a garden sphere with cutouts and Mod Podge. This ball (left) is by Empress of Dirt Facebook friend Pam. The sunflower ball is by Three Green Art. There is Mod Podge made for outdoor projects. You can see it here on Amazon. 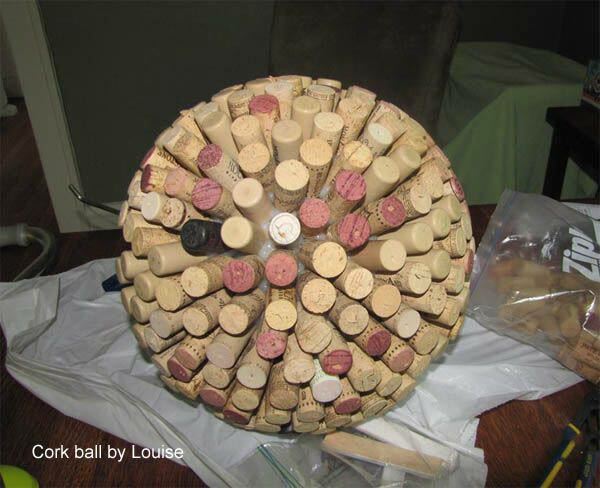 Idea: Save those bottle corks and make a cork garden art ball. 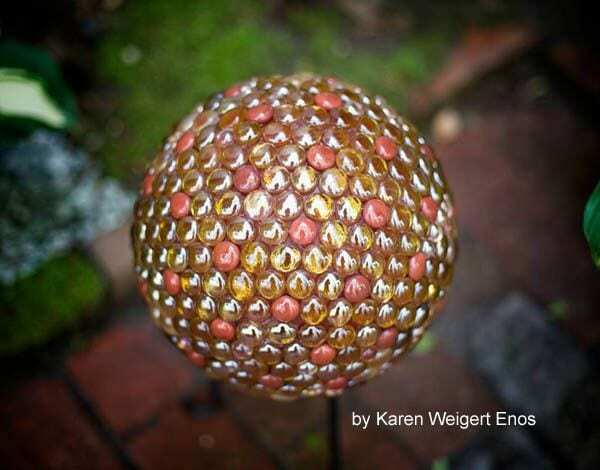 This garden art ball was created by Louise who is an Empress of Dirt Facebook friend. She makes all sorts of creative garden art projects including this fabulous Ironing Board Woman wearing vintage roller skates. In addition to corks, you can use anything that a) you can adhere to the sphere and, b) can withstand the weather. Possibilities include small toys, coins, game pieces, beads, bottle caps, lids, tabs —see what you have at home and get out the adhesive. 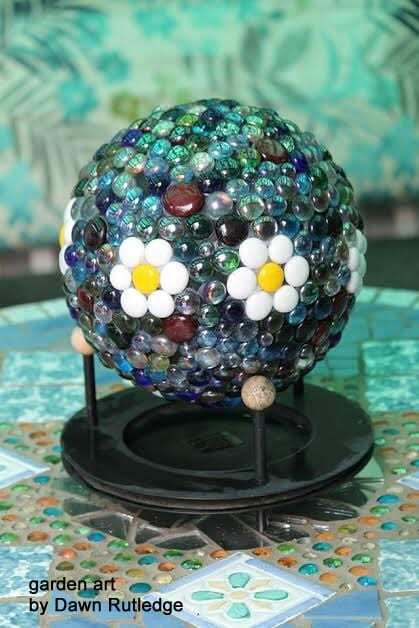 Empress of Dirt Facebook friend Dawn Rutledge made this beautiful garden art ball, creating a daisy design with different colours of glass gems or flat-bottom marbles. 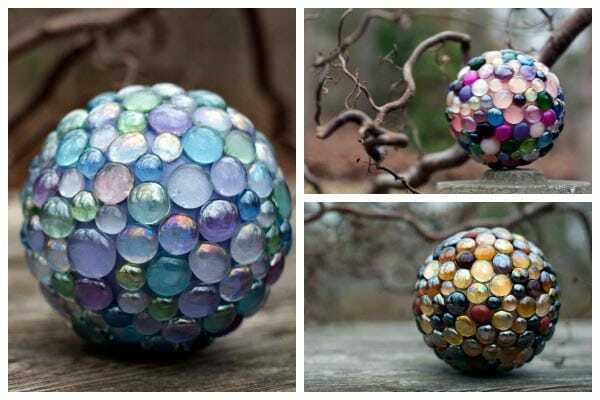 To get started, see these free instructions for making decorative garden art balls. Love your ideas. Have made several globes myself. Pennies, marbles, colored crushed glass etc. Also purchase gazing balls (on sale) and fit them with 7w light bulbs. And hang from my patio cover, in trees, stands and lately totems made from 4×4 redwood posts. Approx. 90 -100 varities in my garden. Love crafting.